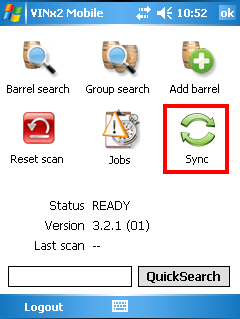 In vintrace, the barrel barcode scanning software has the ability to work without a constant network connection. This can be useful if you don’t have suitable wireless coverage in your barrel caves. You’ll still require a network connection to synchronize the latest barrel details to the scanner, and to synchronize the jobs you’ve completed back to your vintrace database, but you don’t have to have it connected all the time. After updating your barcode scanning software you’ll notice an extra tab at the bottom of the login screen called Sync. In here, we have some new sync options for offline mode. You’ll want to check Enable sync support. Click Save, then back to the Login tab to log in as usual. There is a new Sync option on the main screen. 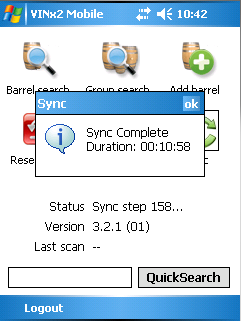 You’ll need to click this to get the latest barrel and wine details, lab results and barrel jobs, etc onto the scanner. Please note that the first time you do this, it can take some time depending on how many barrels you have at the winery. The system also splits the sync into small steps of roughly 100 barrels at a time to make sure the scanner doesn’t run out of memory during the sync. Click ok and you can now work with the scanner. You just need to remember to sync to push the jobs you’ve completed back to vintrace, and to get the next set of jobs waiting for you. You might have noticed on the first screen-shot, there is also a Start offline mode. Use this when you need to log into the scanner without being in wireless range. With this option turned on, vintrace starts offline and will only connect to the server when you need to sync. 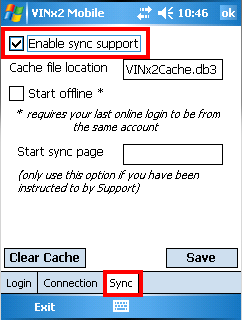 You will need at least one successful login and sync before using this option.